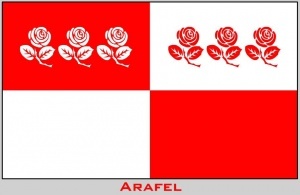 Banner Three white roses on a field of red, quartered with three red roses on a field of white. Like all of the Borderlands, Arafel became a nation near the beginning of the War of the Hundred Years. The governors of the five northern provinces met; the outcome of this meeting was an agreement to form five stable nations. The purpose of these nations was to defend the rest of the continent against the Blight, and therefore protecting the peace of the land. Much f the Last Battle takes place in Arafel, at the Field of Merrilor (AMoL, Ch. 37). The first Queen of Arafel was Mahira Svetanya. Arafel is one of the Borderland nations that is devoted to protecting the Blightborder. It lies between Kandor to the west, and Shienar to the east, with the Blight to the north. The eastern border between Arafel and Shienar is formed by the Mora River and the southern border by the Erinin. The terrain of Arafel is much more rugged than that of its neighbor, Shienar, and is at least partly made up of grasslands. The capital city of Arafel is Shol Arbela. Though it is a large city, it was not built by the Ogier (LoC, Ch. 20). Shol Arbela is the residence of the royal family of Arafel. Tifan's Well, a small farming village is also located in Arafel. It lies in the grassy plains of the country (TGH, Ch. 22). Being one of the Borderlands, Arafel, of course, has a strong army as well as a strong military tradition. The warriors of Arafel are skilled in the way of the sword; they wear two swords, one hilt over each shoulder and both strapped to their backs. They often use both swords at once. Not much is known of the political ties between Arafel and the other nations in 'The Wheel of Time.' It is, of course, rather obvious that Arafel maintains good relations with the other Borderlands, Shienar, Kandor and Saldaea. As the fallen nation of Malkier was also once a Borderland, at one point in time Arafel and Malkier most likely had the same kind of political relations. The relations between the Borderlands are often solidified by marriage; the son of Queen Ethenielle of Kandor is married to one of Paitar's granddaughters (TPoD, Prologue). Other than this, it can be speculated that Arafel has a relatively good relationship with Tar Valon, as Aes Sedai seem to be well respected in the Borderlands. Some people consider the people of Arafel to have a strange sense of honor and debts (TDR, Ch. 29). Native Arafellins are characterized by their large eyes and pale skin. Both men and women wear their hair long and in braids. They usually attach silver bells to the ends of their braids. A popular saying among the people of Arafel is, "The dancing is sweeter on the edge of a sword." Some of the well known characters from 'The Wheel of Time,' come from Arafel. Kiruna Nachiman, Aes Sedai of the Green Ajah, is sister to Paitar Nachiman. Samitsu of the Yellow Ajah, Alanna of the Green Ajah and Asha'man Jahar Narishma, were also born in Arafel.